A couple of things happened this week that reminded me of the good old days of spreadsheets. There are some good memories, but I really don’t want to go back to those days. How about you? Continue reading "Good Old Days of Spreadsheets"
If you've wanted to try Tableau data visualization software, now's your chance! They've just launched Tableau Public, where you can upload your data, and use the free Tableau tools to create amazing interactive charts, maps and dashboards. 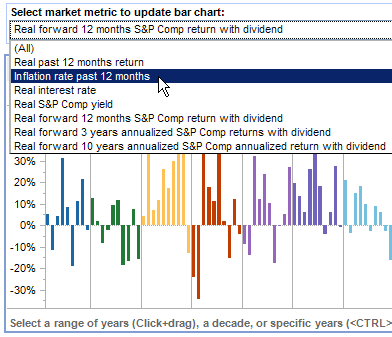 This example shows Economic Indicators & Stock Market Returns, and you can select from a drop down list of market metrics to update the chart. As the product name implies, your saved data will be public, so it's not the place to work with your top secret financial data. It's a great opportunity to experiment with the Tableau software though, using dummy data, or data that you're willing to share with the public. With Tableau Public, you can connect to Excel, Access, and text files, with a limit of 100,000 rows of data per connection. You can save up to 50 Mb of content to the Tableau Public web servers. 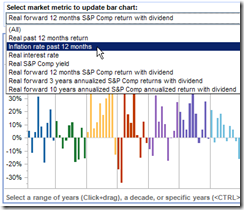 There are other blogs where you can see dashboard examples, and see how people are using the software. 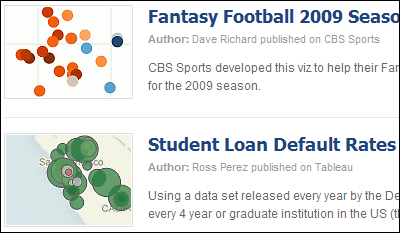 There's also a gallery with dashboard examples, such as the Fantasy Football 2009 Running Backs and Student Loan Default Rates. To get started, go to the Tableau Public page, and click the Download Tableau Public button. Then, enter your email address, and click Submit. To help you understand the software, you can watch the brief Tableau Public Preview video and the Tableau Public training videos. After you install Tableau Public, open it, and connect to your Excel, Access or text data file. It's quick and easy to create a graph, and Tableau will help by suggesting chart types for your data. Your work in Tableau Public desktop will be saved to the Tableau Public web servers, not on your computer. On the web servers, your data will be accessible by anyone on the internet, so don't use Tableau Public for confidential or sensitive data. After you save your work, you can share it, by embedding it on your blog or website, or by sharing a link to your data. If you create a dashboard, you can post the link in the comments here, so other people can go and take a look. I used a trial version of Tableau for a couple of weeks, which has all the features of the paid version. I was really impressed with what the software can do, and got in touch with the Tableau people, to see if I could participate in the Tableau Public beta. The free version wasn't available yet, so they provided me with a license for the paid version, so I could keep experimenting, and post my work in their public servers. An important step in setting up my new laptop is figuring out what's on my old laptop. To get a complete list of installed programs, plus details on hardware, installed security updates, and other details, you can use the free program, Belarc Advisor. Download and install the program, then run it to audit your computer. The results show up in your web browser, although all the details are stored on your computer, not uploaded to the web. The web page shows your overall audit score, virus protection information, and the status of all Microsoft Security Updates. Here's another Windows tip that I found while cleaning my office. If you find a picture while surfing the Internet, you can quickly add that photo to your Windows desktop as a background. The desktop photo is usually covered with documents, but it's nice to see a happy face or calming scenery when you close all your files. Right-click on the graphic that you want to add to the desktop. One of my holiday projects was to clean out some old client files, and the five bags of shredded paper are evidence of my success. In one of the files, I found notes from Windows 98 training that I did for a client. Obviously, a few things have changed, but most of the tips still work. I had forgotten that the desktop icons could be changed to work on a single click, instead of a double click. Here are the instructions, modified for Windows XP. Note: This will also affect the files in your Window Explorer folders. If you're a software developer, you might be interested in this. Neil Davidson has created the Business of Software social network, "For anybody interested in building long term, sustainable, profitable software businesses." Meanwhile, if you're stuck on a project, whether it's software or something else, the SCAMPER Random Question Tool might help dislodge your mental blocks. To understand the theory behind the tool, you can read the SCAMPER guide. When I installed Windows Live Messenger on my laptop, it also installed a folder named My Sharing Folders. Sometimes, when I try to drag a file to a different folder in Windows Explorer, it accidentally touches the My Sharing Folders, a message appears, and the copying freezes solid. Forever. Actually, I get tired of waiting after a few seconds, and use Ctrl+Alt+Delete to shut it down, and start over. After it happened again today, I was determined to get rid of the annoying folder, but there's no obvious way to delete it. It would make sense to right-click on the folder and select Delete from the list of commands, but it's not available. So, the Googling started. The first suggestion that I found said to install Tweak UI and uncheck the folder name in there. No problem installing Tweak UI, or unchecking the box, but it had absolutely no effect on the folder, even after a reboot. Back to Google. The next suggestion was to open Windows Live Messenger to determine its version number. I have Build 8.5.1302.1018 and of course there's no way to copy that number onto the clipboard, so I typed it into a text file and copied from there. Then, I closed the Help window, clicked the Windows Start button, and clicked Run. I clicked OK, but unfortunately, that didn't work either. All I got was an error message. Back to Google, where I found a variation of attempt 2, but with a different path. I had to retype the " which was slanted in the notes. This line ran without problems, and removed the My Sharing Folders. The victory was short-lived though -- the next time I restarted the laptop, it was installed again. Finally, I found an article on the SuperWasp site. Their solution requires registry edits and file name changes, but it removed My Shared Folders and there was no re-installation when I restarted the laptop. Woohoo! But why does it have to be so complicated? Have you ever bought software that came with free upgrades for life? In the Successful Software blog, Andy Brice asks if you should give customers free software upgrades for life. 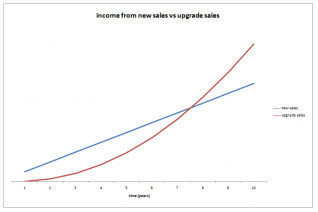 He created an income model in Excel 2007 that you can download, to test different scenarios. I can't imagine why anyone would offer free software upgrades for life. Certainly, if there are minor upgrades or patches to the current version, or a major upgrade is released shortly after a purchase, then I would expect to get those at no charge. Otherwise, if I want to enjoy the new features that a developer has worked hard to create, I'd pay for the upgrade. But don't worry, upgrades to this blog will continue to be free, as long as I can afford it! A while ago (in May! ), I posted about using Taskbar Shuffle to rearrange the icons in your Windows taskbar. This is handy when I have lots of windows open, and I want a couple of them to be readily available. If I drag their icons to the far left of the Windows Taskbar, they're easier for me to find when I need to access those windows. Yesterday, Lifehacker posted an article about Taskix, which is another tool for rearranging taskbar icons. Apparently it's much smaller than Taskbar Shuffle, and very similar in functionality. I've installed it, and it's working very smoothly, with no noticeable difference from Taskbar Shuffle. You can download Taskix for 32-bit or 64-bit systems, then use it to rearrange or close the windows icons on your taskbar. Simply drag a Window icon to a different position on the toolbar, and release it to place it in the new spot. Or, point to an icon and click the mouse wheel to close that window. Maybe I'm the last person in the world to learn this, but with two big monitors to navigate, I find this tip pretty handy. You can add a Links Toolbar and My Desktop Toolbar to the Windows Taskbar! Continue reading "Add Links to the Windows Taskbar"